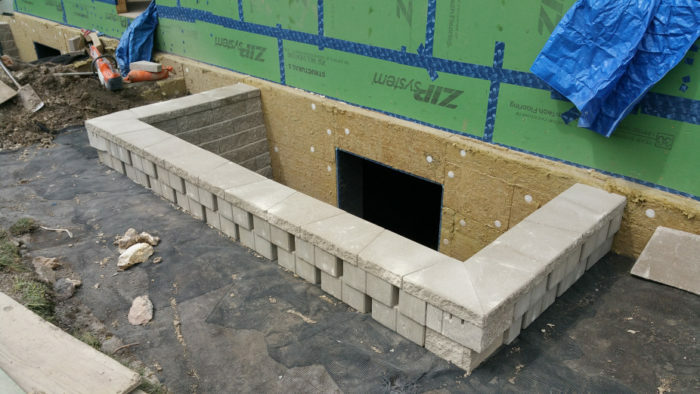 Natural light for the basement: The short windows typically placed near the top of a concrete foundation don't allow much light into the basement. These masonry window wells will make all the difference. We always wanted a basement for our new house. The idea of building a new house on a slab without a basement was foreign to us. Both my wife and I grew up in homes that had very active basement areas, with fond family and friend-related memories. For both of us, basements were places to go for various games (board games, ping pong, pool, etc. ), watching TV with family, a place for bulky exercise equipment, or just respite from the hot summer sun. And to improve the basement’s “livability”, we wanted it to have a 9-foot ceiling height (we felt it made a big difference in our last house over a 7-foot or 8-foot ceiling), as well as large windows facing south. 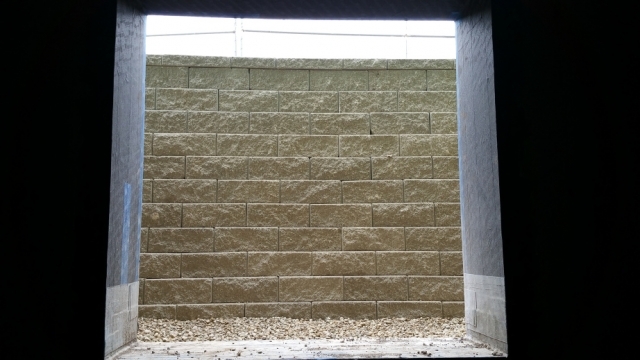 After exploring the options, including the Spycor line of products, we decided to go with real retaining walls made of cement blocks. In researching the Versa Lok products , I came across a series of interesting videos by Dirt Monkey on YouTube about retaining walls. We like the long-term structural stability of Versa Lok, and it helps us achieve the Urban-Rustic look we’re going for. 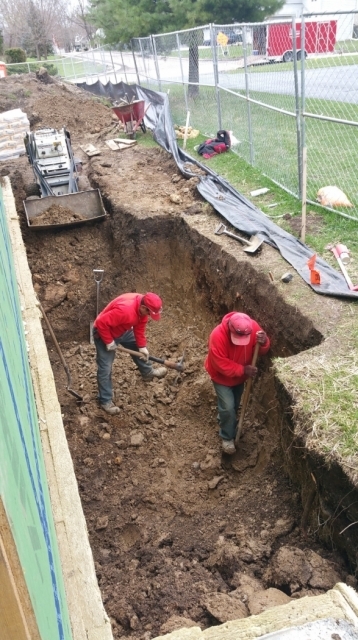 First, Felipe and Candido dug out and shaped the hole for the window well. The hole is as deep as it needs to be and ready for footings. 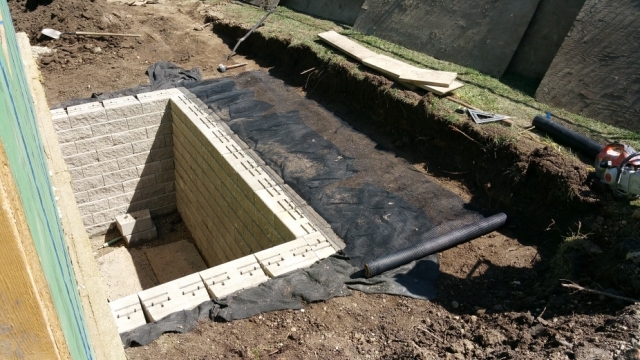 Blocks will rest on a concrete footing, reinforced with steel. 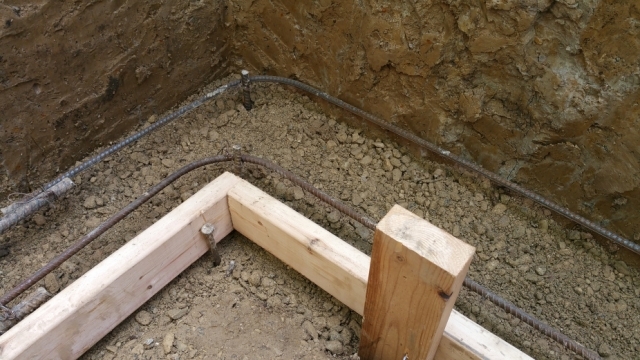 We connected the footing for the window well to the foundation with rebar. After the guys set the rebar in the foundation through the Roxul insulation, I stuffed the holes as much as possible with insulation before they did their pour for the footings. 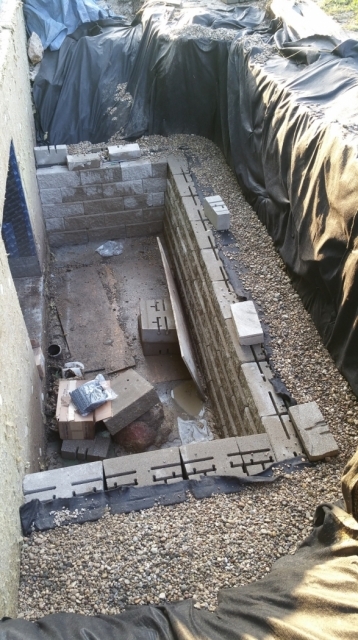 The first row of block set on the footing. Geotextile fabric installed to stabilize the soil and improve the overall integrity of the wall. A completed window well from inside the basement. We wanted a basic concrete gray, which we thought would complement our overall Urban Rustic design look, in particular the eventual charred cedar siding. This project began for us back in the summer of 2014 — nearly three years ago — when we first sat down with Brandon Weiss in what was then his new office in Geneva, Illinois (as detailed here). Things did not go well for us with Brandon or his company, Evolutionary Home Builders. After we decided to move forward and try to complete what we started, the question became: Who do we hire as our next builder? That led to our interactions with Mark Miller and Katrin Klingenberg (detailed here). 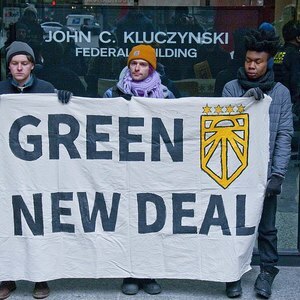 PHIUS (Passive House Institute U.S.) did not seem like a resource we could utilize — the Passive House world is small, smaller still when you reduce it to a single geographical area like Chicago and its surrounding suburbs. 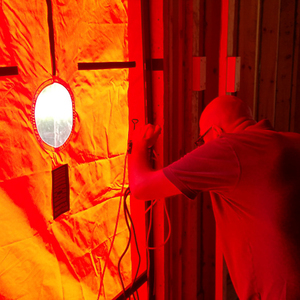 And the thought of interviewing conventional builders, and trying to convince one to take on the detail required in a Passive House level build, seemed overwhelming. As a result, we decided to go with two guys close to home who have conventional building experience. The logic underlying the relationship was that they would GC the build, taking care of all the conventional building details, while I took care of all the Passive House details. Events revealed they didn’t have the requisite skill set necessary to complete the job, and we have subsequently taken over the project ourselves. It’s taken weeks to get things back on track. When the build is complete, I’ll return to this matter, offering more details that will hopefully help other consumers who want to build a new house avoid our unfortunate experience. The really sad thing is there are quality people who make a living as general contractors, but unfortunately it remains a minefield out there for consumers without meaningful connections. If you don’t already know the answer to the question “Who should build our new house?” before you start the process, then it’s truly a case of caveat emptor. And if things should go poorly, you will feel like you’re on a very lonely island. Did you include a drain o remove water that might accumulate in the well? Is there a drain line in the fill behind the blocks? The occasional lake effect blizzard can dump copious amounts of drifting snow as far inland as Palatine. I'm curious at to what snow mitigation methods are planned here? Uncovered exterior basement stairwells are a PITA to shovel (ask me how I know! :-) ), but a light well could be even worse. Is there a need to shovel a light well? Q. "Is there a need to shovel a light well?" A. Not in all cases. But there is certainly a need to do so if the window is intended for emergency egress during a fire. Most window units aren't designed to be buried in snow for weeks/months on end. If snow accumulates up against the window freeze/thaw cycles will put pressure on the (very expensive, if PassiveHouse-grade) window glass at the crust layer on top of the snow, as well as potential freeze/thaw damage at the weatherization seals of the window unit. Of course if it's an aquarium-grade windo unit with aquarium-grade installation methods it can handle just about anything. 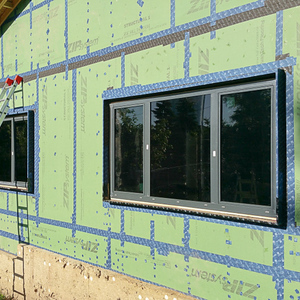 But those aren't usually high thermal performance triple panes. of me as a kid having to climb down inside those things every fall and spring to fish out debris among the lizards and spiders. Are these enough better than the typical window wells made from corrugated steel in a half round shape? 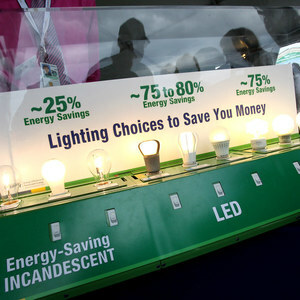 Seems like a big expense for little or no more light. It's especially puzzling given the owners' repeatedly expressed concerns about costs, as set forth on their blog. 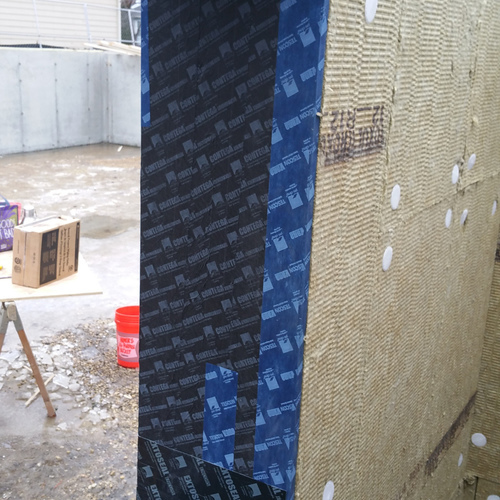 IRC R310 shows how to properly design a window well. The pictures in this article show that this well needs to have a permanent ladder for egress. Also, if rain, snow, safety or privacy is an issue, you could always install a window well cover specific to the need. I was just curious as to which approach (if any) was under consideration here. If you don't claim it as an egress window, do you have to build the window well as such, including ladders? We had a grate made of steel bars across our egress, and just put on a translucent window well cover in the fall to minimize the amount of leaves and snow inside. When I shoveled after a snow storm, I just took a couple of swipes with a push broom to clear off the window well cover. It depends on vertical depth... See R310.2.3.1 at https://windowwellexperts.com/egress-codes/2015-irc-egress-codes/. In my previous life as Builder in KS, whenever I built a house in golf course subdivisions, where no privacy fence were allow, and all houses had basements and window wells, I installed a wrought iron frame with clear PVC window well cover and a latch on the inside. It gave privacy as well as allow light to come in. I should have started your answer by saying that if you have a bedroom or habitable space in a basement, it must have a form of fire and rescue egress. See R310.1 at above link. i remember years ago doing a final inspection of a house I had designed. When we went down into the basement the quality of light was extraordinary - all blue and swirling. The driveway had been graded so that it drained into the window well, which was full and looked like an aquarium. Not great from a building science standpoint, but an aesthetically pleasing experience. I've found the nicest way to introduce light into a completely submerged basement is from the floor above using a large open stairway or light well.. It also helps make the space feel less isolated. 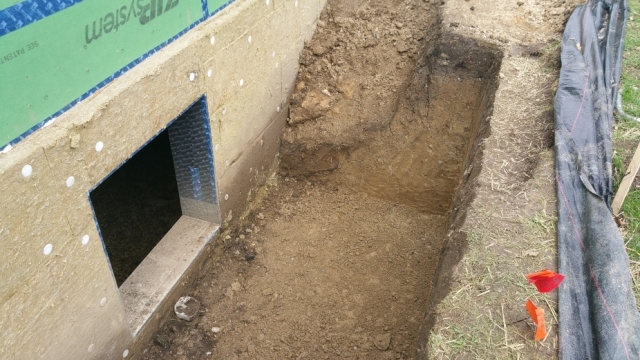 * There is a drain inside each window well, along with a drain on the outside of each window well at the base of the walls, all of which ends up in our drain tile system at the base of the house foundation. * Snow will have to be shoveled out if it's significant and it sticks around. * Each window well will have its own ladder in case of fire, along with a decorative fence bolted to the capstones for safety. * Once we decided to go with a basement and a main floor, as opposed to a 2-story on slab, we wanted to maximize our use of the basement. In addition to having a variety of uses --- home office, game room, workout area, etc. --- we wanted to get as much natural light into the basement as possible. The window wells weren't cheap, but so far we're very happy with the outcome. Our last house had three standard corrugated steel window wells, but even during the day we felt compelled to turn on lights. So far these new window wells are working as intended, allowing substantially more light in, reaching even the back of the basement, making it feel more like normal living space rather than a typical basement. The real test will be in January and February, when we find out how much winter sun is able to make its way in. 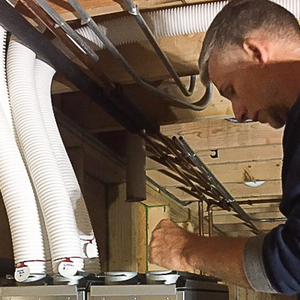 For those who use their basement mainly for a mechanical room and storage, these oversized wells don't make a lot of sense, but for our needs we feel like they were a good investment in the overall feel of the house. I'll post a series of pictures on the blog, noting the change in seasons and how much sun gets in, once the project is complete and we've settled in. Eric, how do you plan to finish the exposed Roxul in the window well? Ethan, sorry I missed your question from earlier this week. 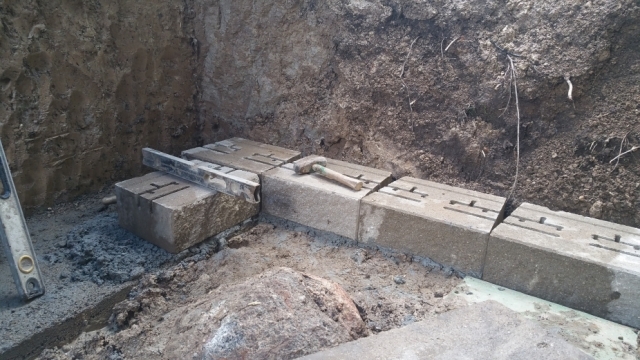 We're planning to attach vertical 1x4's with Simpson concrete anchors through the 5" of Roxul and into the foundation. At that point we will attach a second layer of 1x4's horizontally, which will be the nailing base for the cedar siding. Initially we were going to use a cement board with a parge coating, but we've had trouble finding long enough flathead concrete screws --- we're assuming we would need at least a 7 - 7 1/2" concrete screw (5" through the Roxul, 1/2" through the cement board, and then at least 1.5" into the foundation itself). 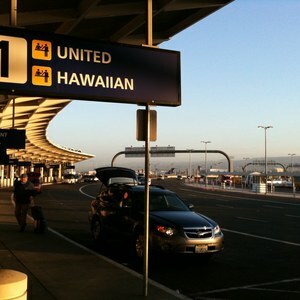 We still have time to come up with an alternative, so if anyone has suggestions, we'd be open to a different solution.